Property 9: Garden, swimming pool, private parking, wifi, pool, air conditioning, central. Property 11: La Casa Nazari, cottage with wifi and fireplace. 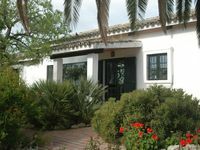 Property 15: Cottage "Casa del Huerto"
Property 31: Sierra de Grazalema, 2-7 people, village center, pool, garden, wifi. The house was very nice, with a lovely garden for the kids to play, and for us to sit in the sun with a glass of wine. Good location. Bit of a challenging walk to the main part of town, but not too bad. And there are some restaurants/shops close to the house. And a nice playground too. The location is very picturesque. Beds were very comfy and had beautiful linen. We thoroughly enjoyed our stay and would happily recommend to others.